A big thank you to all the speakers at GGI2018 last weekend. The conference was once again a great success and the room was filled to bursting point on many occasions. The videos will be going up on the YouTube channel over the course of the next several weeks, but in the meantime, here is a handy list of the DNA Lectures at GGI2018 with links to the live-streamed videos on the GGI Facebook group. Just click a link to view the live-streamed recording of the lecture. You will be prompted to join the GGI Facebook group if you haven't joined already. My thanks to Michael C Carragher for putting this list together. Created by Michael Carragher (watching in New York). 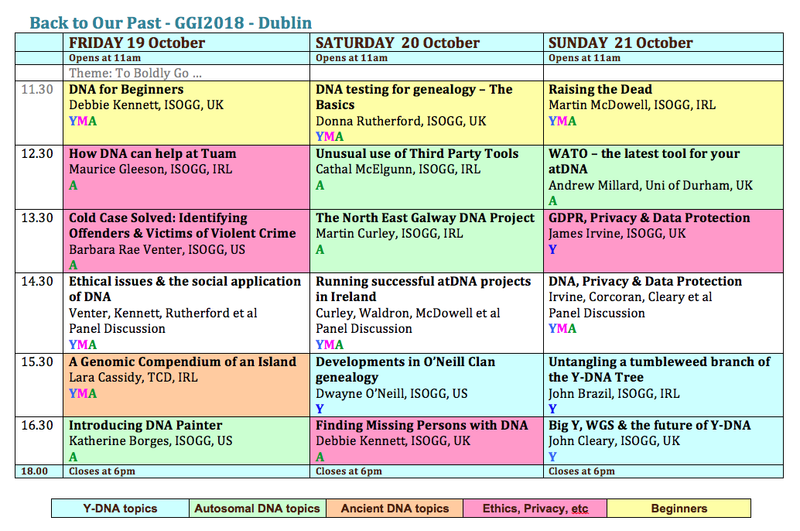 There are fifteen lectures and three Panel Discussions at this year's Genetic Genealogy Ireland. And there are twenty people either speaking or appearing on the Expert Panels. The Speaker Profile page gives a complete run-down of this year's Speakers, together with a brief biography, how they got involved in genetic genealogy, and what they will be talking about this year. Simply visit the Speaker Profile page and click on the Speaker's name to see their profile. Beginner's talks will be given by Debbie Kennett and Donna Rutherford. Ancient DNA will be covered by Lara Cassidy (reporting on >100 ancient Irish genomes). Topics around Ethics, Privacy & Data Protection include talks by Barbara Rae-Venter, James Irvine, Debbie Kennett & Maurice Gleeson. Third Party tools will be the subject of a variety of presentations, including those by Cathal McElgunn (Promethease), Martin McDowell (Lazarus), Katherine Borges (DNA Painter), and Andrew Millard (WATO). Y-DNA topics will be covered by John Cleary, John Brazil and the O'Neill Project Team. Autosomal DNA Projects will be discussed by Martin Curley and the subsequent Panel Discussion. The lectures will be live-streamed each day on the Genetic Genealogy Ireland Facebook group courtesy of Gerard Corcoran. If you want to see the talks, you need to be a member of the Genetic Genealogy Ireland Facebook group - it is completely free to join. The lectures will be recorded and it is planned to upload them to the GGI YouTube channel throughout November. Last year, we had a great line-up of speakers and topics for GGI2017. The 3-day event (20-22 Oct 2017) had the largest audiences yet, but as the lecture area was in the main hall of the exhibition centre, the sound quality of the recordings of the lectures was less than optimal. Nevertheless, with a bit of technical massaging, the audio has been manipulated to be as good as it can possibly be and on some of the videos it is reasonably okay (despite the background noise). 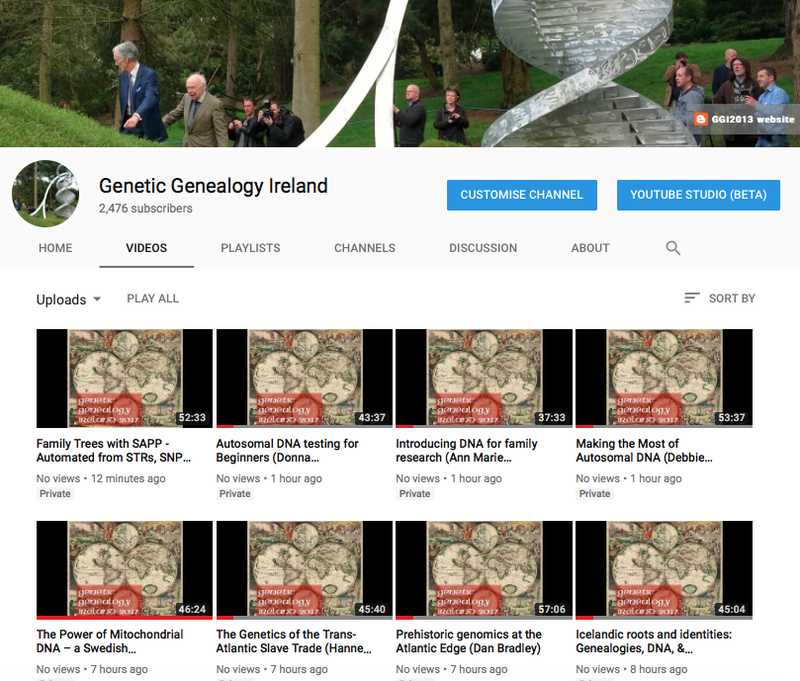 All of the videos (15 in total) are going online en masse today (11 Oct 2018) and you can view them on the Genetic Genealogy Ireland YouTube Channel. For ease of reference, here is a list of the videos. To view a lecture, simply click on the speaker's name. Maurice Gleeson ... What do your Y-DNA results mean? 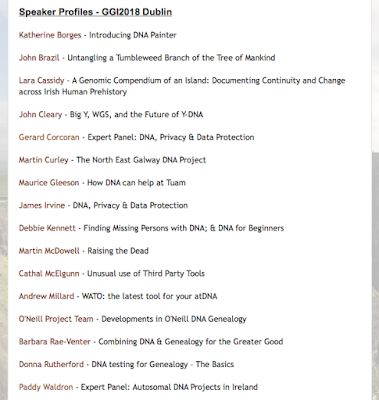 Presentation: The North East Galway DNA Project - how Gedmatch & Facebook combined are helping people connect with their Galway roots. 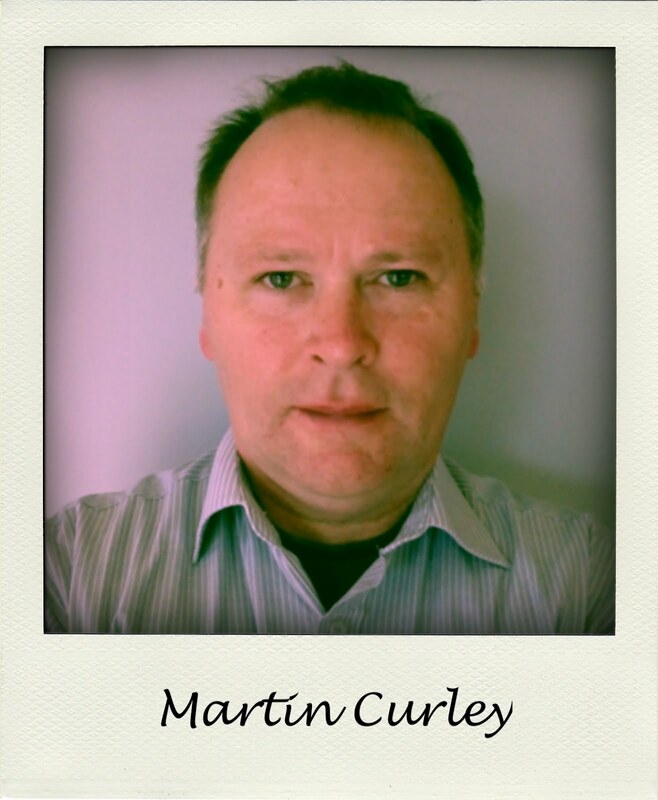 Martin Curley is a native of Guilka, Menlough in east Co Galway. As a teenager he began to start handwriting his family tree but this was limited due to the lack of access to records. His interest was revived when he emigrated to the US and met family on both paternal and maternal sides in New York, New Jersey, and Salem, Massachusetts. He began to start compiling other families' trees when living in Liverpool, England with much success and gave him an idea to consider working full time in genealogy. 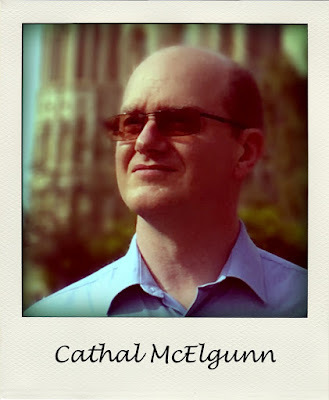 Returning to Ireland in August 2013 he started his own business in Genealogy and Heritage, working with schools delivering workshops and with families in researching their long lost cousins. Hod did he get involved in Genetic Genealogy? DNA tests became popular in 2015 and Martin was at the forefront in east Galway in getting people to test. A successful family history project in Ballygar in 2016 was augmented by parents doing a DNA test. This led to the start of a FB group in 2016 for the area and currently this has several hundred members scattered throughout the world, all with roots in Ballygar. Other parish and area Facebook groups were started in 2017 which replicated the success of the Ballygar group. In 2016 he started the Mannion DNA Facebook group which has 500 members and with over 300 DNA profiles. This has been a successful complement to the Mannion Gathering which has now become an annual event. He has published articles about some of the success stories including the re connection of cousins, descendants of an Orphan Girl, Ellen Hansberry, who was given assisted passage to Australia in 1852 whom he reunited with their Irish cousins as part of a project featured in RTE's Nationwide in May and August 2018. Currently he is working on the Cusack family of Newbridge Galway whose most famous descendants are Joan & John Cusack as well as the Mannion family of Senator Tim Kaine of Virginia, US Vice President Candidate in 2016. He is also kept busy with delivering workshops in schools in Galway, Roscommon and Mayo and assisting people in analysing their DNA results as well as tracing their family roots. So what will he be talking about? Martin will discuss how the combination of Gedmatch and Facebook is helping people reconnect with their Galway roots. Furthermore, the lessons learnt from this project willl have direct applicability to similar projects both within Ireland and globally. Where can you find more information about Martin? Martin's Facebook page can be found here. Dr John Brazil MSc PhD. Retired. Previously a Clinical Biochemist, a Medical Science Researcher, a Medical Laboratory Scientist, a Laboratory Information System Manager and a Public Health Information Systems Manager. I am investigating the genetics of my own Brazil family and other Brazil families in Ireland. I am also an FTDNA Project co-administrator with a number of Y DNA haplogroup projects including R1b-CTS4466 Plus and RL21 4466&SouthIrish. I am especially interested in R-A151 and particularly my own R-A714 sub-branch, trying to identifying historical events that might explain their distribution and the various surnames associated with these branches. Having a relatively unusual surname I am repeatedly asked where it came from and usually encounter surprise when I reply it is a native Irish surname. Likewise my mother’s maiden name is unusual in Ireland. This eventually led me to investigate these names further and to try to determine where they came from and to determine the history associated with them. 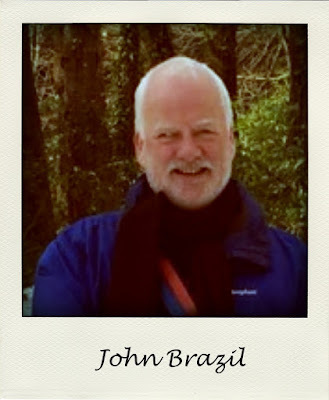 My genealogy and historical research identified numerous Brazil families associated with different locations in Ireland. I turned to genetic genealogy in an effort to identify the relationships between these families and also to determine what other family names might be associated with my Y chromosome haplotype. Early on in my genetic genealogical research I became aware of close genetic paternal ‘cousins’ from the south east US with an apparently English surname but with an Irish genetic haplotype clearly of relatively recent origin. The genetic relationships between men who possess the Y chromosome R-A151 haplotype, the geographical distributions associated with this and its various sub-branches and historical events that may have contributed to this. What is the relevance of this to Ireland & Irish genealogy? The R-A151 haplotype is itself a sub-branch of the R1b-CTSS4466 haplotype, a haplotype that is closely associated with Munster in the south of Ireland. I'll discuss the genetic relationships between men possessing these haplotypes, their surnames and the locations reported for their Most Distant Known Ancestors and trying to identify historical events before and after the adoption of hereditary surnames that might have contributed to the social turbulence and geographical dislocation associated with this distribution. Brazil (Wexford in Ireland), O’Connell (Kerry, Limerick and Clare in Ireland), MacAulay (of Lewis and Harris in Scotland), Thrasher and Davidson (US), Hill (US but also England and Sweden), Shinnick (Cork in Ireland) and Fox (in Tipperary in Ireland). And various surnames of Welsh and Scandinavian origin. A website focussing more specifically on the R-A151 haplotype and its sub-branches is currently under development and will hopefully be available within the coming months.